This issue the new year Annual Day programs at 6 institutions in the month of January 2018. This newsletter gives a detail update on how we went about executing so many programs within our limited resources of volunteers and time. A quick round up a quick round up on some of the key events that took place at Tarun Sadan and other Education activities during the period. This issue features "Volunteer Speak" that brings to you the inspirational story of Mangesh Khamkar, who stayed at a CWI during his childhood and despite many difficulties is well settled in life today and is an active volunteer in Vinimay's camps for children from the CWIs. It also covers Vinimay's camps held for boys and girls from various CWIs where we endeavor to "Make Learning Fun". A roundup of our regular activities during the period April to September 2017 also forms part of this newsletter. This issue covers story of Narayan Velande (Gorappa) in our feature “Spreading our Wings”. Also the launch of our “MathLab Project” wherein we aim to teach Mathematics in a fun manner through various tools is discussed. Also the celebration for various festivals, a film screening program, the celebration of the Annual day and many more activities in our Youth Hostel finds mention in this issue. 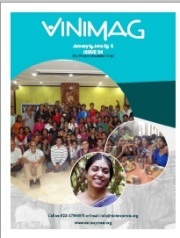 Vinimay Milan, the annual gathering of the Vinimay family was celebrated on 26th Jan 2015 and the issue outlines the activities carried out during this event. A health camp held for the Tarun Sadan boys also finds mention in this issue.